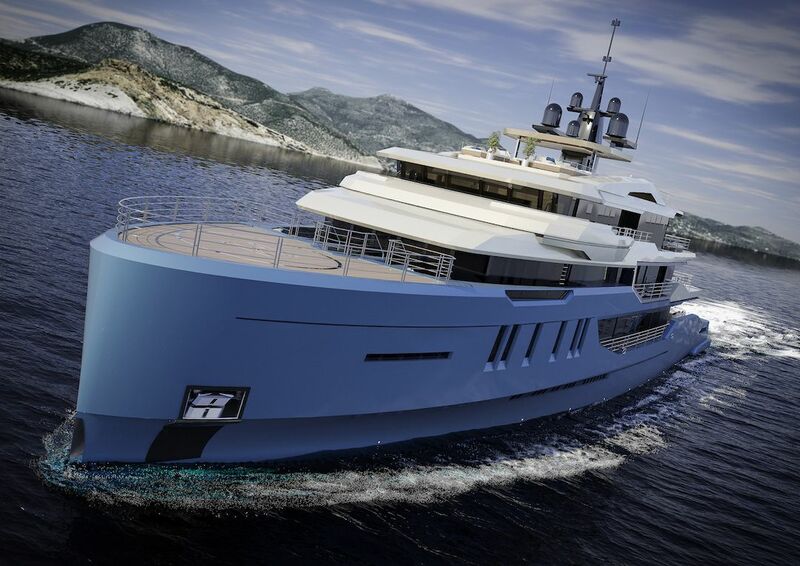 Construction of the new 68 metre M/Y Day’s, the first of the CCNY Ice Yachts range, is on schedule and proceeding as planned, in collaboration with AES Yacht. 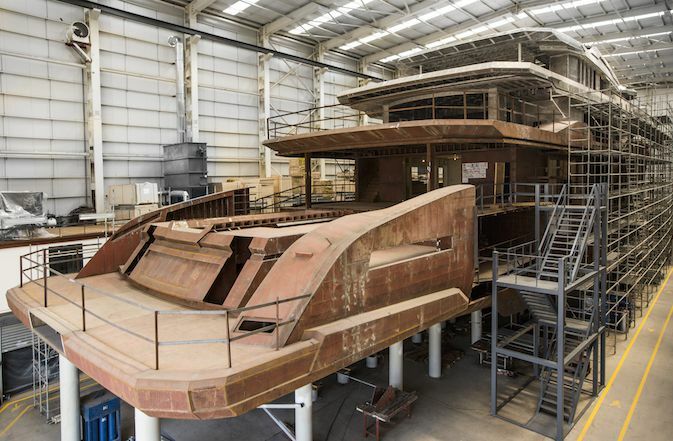 Construction of the new M/Y Day’s is proceeding according to plan and on schedule. The fully custom 68 metre superyacht’s estimated delivery date is for the end of 2018. Part of Ice Yachts Explorer Vessels all-new range, M/Y Day’s will accommodate 12 guests including owners. The owner’s area occupies the entire upper deck and is characterised by a spacious cabin forward. The apartment-like feel is created using large continuous full-height windows all around. Two large walk-in wardrobes, two generous en-suite bathrooms, plus a gym and massage room are also present. The guest area is on the main deck with three big VIP cabins, one guest cabin with single beds and an additional supernumerary cabin. All guest cabins are equipped with en-suite bathrooms and walk-in closets. The yacht has five decks, with an overall length of 68 metres and a beam of 13 metres. The internal volumes are very impressive, at more than 1,800GRT. These volumes are one of the biggest strengths of the M/Y Day’s. Interior headroom on the main and upper decks reaches 2.7 metres. Full-height windows emphasize space and create a direct rapport to the exterior environment. The interior spaces are characterised by a minimalistic design with an elegant and warm feeling due to the use of refined materials, where natural lighting is the main element. Two large tenders are present in the lower deck garage, while a helipad is located forward on the bridge deck. The beach club with shower and head is on the lower deck, a large pool welcomes you at the entrance to the main deck. 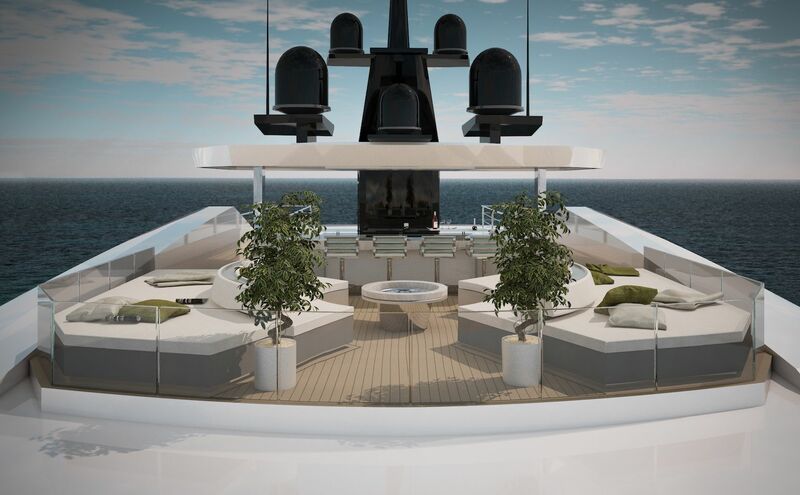 The yard and designer paid special attention to the owner’s privacy, developing private and direct access to the sky-lounge business meeting room straight from the tender’s berth. The owner will use the yacht both for leisure and business and the design layout has taking this into consideration. All equipment has been selected and ordered from well-known reputable international brands and suppliers.